The characteristics of a workplace have changed drastically over the years. Decades ago, employees used to stand, sit, move, or a combination of all of those to accomplish manual labor or practical tasks. As technology slowly started to prevail and influence the way we work, people sat down in cubicles and had desks to themselves. It’s fascinating to think about all the transformations that have happened since humans formed a labor force. So, how did flexible office spaces back then evolve to what it is now, and what changes will occur in the future? Read on below to find out. Contrary to popular belief, coworking is not a new concept. As early as 1966, a company called OmniOffices Group, Inc. set up the first shared office space in the world. However, the term wasn’t coined until 1999 by American computer game designer Bernard DeKoven. The turn of the millennium signaled a change in how people did their work tasks because of the introduction of the internet and the availability of new jobs in the market. In the last decade, coworking spaces quickly rose to popularity due to its many economic and practical benefits for startup companies, and the social and collaborative advantages for freelance workers. More businesses can focus on their goals versus shelling out cash to fund their private office space. Simply put, it satisfies the needs of the evolving workforce and companies today. There are pros and cons to both working in a shared space and traditional office, and in the beginning, you may get confused in identifying which ones are best for you. 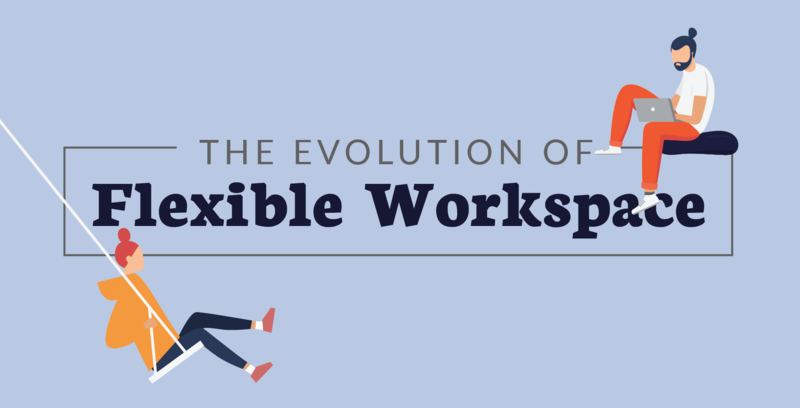 Here are the main points that best explain what a flexible workspace is. Ability to expand or shrink operations easily at a fraction of the cost. In a flexible setting, you only pay for the space that you need. Whether you’re growing or downsizing, setting up your HQ in a coworking workspace will be easier on your budget. Ready access to all necessary work equipment. If you’re a start-up, having all the tools that will propel your business forward right at your fingertips is crucial—no need to worry about where you can get access to stable internet and state-of-the-art facilities. Opportunities to personalize and incorporate your branding in a flexible workspace is minimal. You will be adjusting to the layout of the place you lease, so you need to be comfortable in the area you want to stay in. Because leasing terms are flexible, you don’t need to be present in the office daily. This is great for employees who favor work-life balance, or if you only want to meet a couple of times a week to align. 61% say they like appealing, comfortable workspaces. 47% appreciate a positive, collaborative, and engaging community atmosphere. 47% want special perks like free meals. 32% want facilities that enrich learning. Coincidentally, three or four out of five in this list are met by coworking spaces. Most adopt a modern design with natural lighting and colorful backdrops to make it versatile for every type of worker or company who leases the space. Additionally, being exposed to other people and sharing information with them is becoming a pressing need in our technologically flooded world. Some even go so far as to have function halls for talks and meetings where all tenants are welcome to attend. Flexible workspaces relieve the pressure from management to immediately fulfill these needs in the early stages of the company. Work satisfaction and productivity are increased, and people get to focus on other tasks they need to accomplish for the business to grow—it’s a win-win for everyone. Where is the Future of Flexible Workspaces Headed? Shared workspaces have been growing at a massive rate of 200% over the past five years, and it doesn’t look like it will slow down anytime soon. The future of coworking is predicted to keep on rising at a healthy growth rate of 15% in the next five years. While this industry mainly services freelancers and small teams, big corporations are catching wind of the benefits this can give their business regarding global expansion as well. All Work reports that by 2020, 50% of large companies will have some form of shared office space. Stats also show that the number of people who will work in shared offices will rise to 3.8 million by 2020 and 5.1 million by 2022—that’s a significant portion of the entire workforce. This is because the priorities of people in the workforce are changing. A pleasing aesthetic, collaborative environment and a flexible schedule are some of the top things that employees look for in their jobs to increase their satisfaction with work. Technological advancements will transform coworking spaces into classy business hotels where people only have to show up and all their business needs will be available to them in a snap. This will effectively change the way landlords acquire and develop buildings and workspaces—they have to adopt the role of an innovative designer versus a simple space provider or property owner. The coworking industry will continue to grow over the years, possibly even eclipsing traditional workspaces and changing the culture and lifestyle of how people work more than ever. Whatever the future will bring, it’s exciting to ride the tides of change and see how community-building, networking, and collaboration take center stage as the success indicators of businesses.